ysabetwordsmith | Poem: "Morning Waits at the End of the World"
Poem: "Morning Waits at the End of the World"
This poem is spillover from the May 2, 2017 Poetry Fishbowl. It was inspired by a prompt from kyleri. It also fills the "sleeplessness" square in my 4-3-17 card for the origfic_bingo fest. This poem has been sponsored by Anthony & Shirley Barrette. It belongs to the Officer Pink thread of the Polychrome Heroics series. Warning: This poem contains some intense topics. Highlight to read the warnings, some of which are spoilers. Despite being in a much better situation now than he was recently, Nebuly is stressing out over the changes. There is insomnia, depression, awkward personal history, guilt, fatigue, and other angst. On the whole, though, Nebuly is making great progress and has awesome family-of-choice. If these are sensitive issues for you, please consider your tastes and headspace before reading onward. "Morning Waits at the End of the World"
he was panicking about it. not to mention his prior complications. that folks could explore on the way. wishing that he could fall asleep. the trickle of water in the sink. she still noticed that he was awake. "Can't sleep?" Marjoram said gently. I think, but not much," he said. "Care for a cuppa?" she offered. Peaceful Evening, and Gypsy Moon." didn't do much but taste good. about talking in the middle of the night. "Coming right up," Marjoram said. to add sticky labels alongside in English. the pillows around, trying to get comfortable. so tangled up you can't sleep?" she asked. Nebuly looked at her, then looked away. "I don't want to sound ungrateful," he said. "It's just ... I don't know what to do,"
a better bed than I've had in a while ..."
and spinning and I can't stop." with a nod. "It sounds uncomfortable." and this is ... all different." "It's very different, isn't it?" too. I took a while to get used to it." "I'm not sure I can," Nebuly said. been with the caravan for a day!" is unsettling just because it's new. you feel about all of this." like someone ringing a gong. and went to pour it for him. the three pine trees on the side. had been eating out of a mixing bowl. This made him feel a little bit at home. a half-smile for Marjoram. "It helps." Marjoram must have put honey in it. when I first moved into the vardo?" she asked, sitting down beside him. as he took another sip of tea. It soothed his nerves a little. 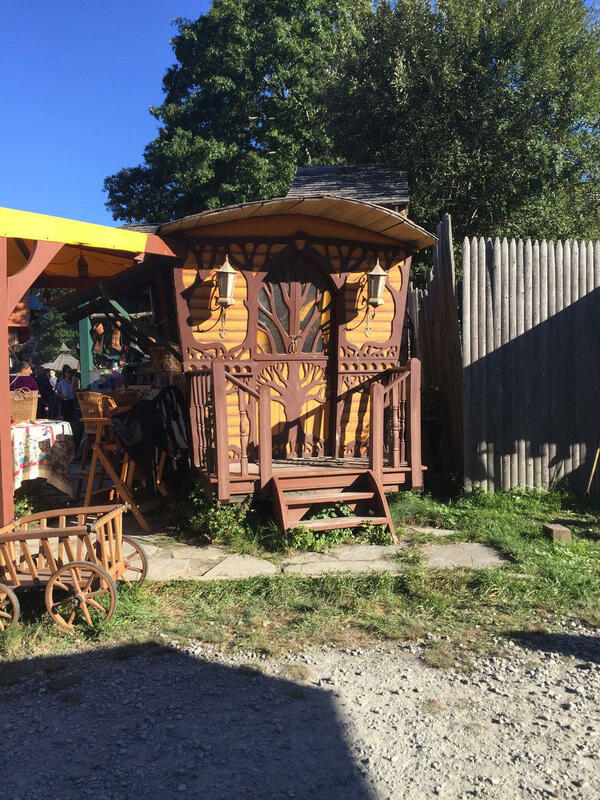 at the faire put us working close by,"
so he invited me into the caravan." "like something from a fairytale." "That's how I felt for the first two days,"
Marjoram said, "and then I freaked." fall out of love or something?" for sure that I'd just ruined my life." "That sounds like you had a bumpy ride. What did you do?" Nebuly said. to yell and throw things for a while,"
Marjoram said, blushing a bit. "Did it help?" Nebuly said. he hadn't tried it recently. so I could talk with Amergin," she said. to most people, they take a while to adapt." at you or anything?" Nebuly said. what I was trying to feel out for myself." "How did that work out?" Nebuly asked. was changing as the tea slowly cooled. Marjoram laughed. "I didn't last a week,"
I had a perfectly good lad right there." "I'm glad that you got through it,"
are good for each other." "We really are," Marjoram agreed. "We want to be good for you too, though. we'll do whatever we can to help." what I need," Nebuly said. "Sit with the feeling," she said. and see where it takes you." with a frown. "I don't get it." how it could go if you decide it's not for you. We'll let you off anywhere you like, if necessary. What will tell you which is the correct course?" Nebuly shivered. "I don't want to leave,"
he said. "I've lost enough people already." "You're welcome to stay as long as you like,"
to see Amergin standing over them. "Sorry," Nebuly said with a wince. "We didn't mean to wake you up." that the nervous phase passes too." the end of the world," Nebuly said. anxious, and both at once is awful." the world," Amergin said solemnly. had grown up on the road." "I did, so it was different for me,"
afraid that I'd made a terrible mistake." "Then what happened?" Nebuly said. finished the last of his tea. "I found my feet and had the time of my life,"
Amergin said with a laugh. "It's worth it." here to there," Nebuly confessed. the real road, not just scuffling,"
for you to learn more about the life." when he returned, he began to sing. Ever the wide world over ..."
the sweet words roll over him. the open road with someone you love. And the world is all at our feet!" through the gauzy green curtains. pressing him into the mattress. somehow swept it away. "Nonsense,"
already when I got up." or the tea -- had caught up to him. An enormous yawn made his jaw pop. with a smile. "Let's not waste it." and he began to sing the same song. Nebuly lay down and let it carry him away. See the exterior and interior of Amergin's vardo. Worth mentioning is that the variety is much wider in T-American faires than it is in L-American faires, although the latter have diversified more in recent years. What we have here are mostly generic English Renaissance faires, with some medieval, some French or Highland events, and a few pirate or fantasy ones. T-America has Renaissance faires of many countries -- which means they spread over that whole time period, because the Renaissance arrived at different times in different places. Pirate faires are enormously popular, and fantasy ones are well known. Ethnic faires often network with Sankofa Clubs, such as the occasional African or Egyptian event. Depression can be a mental illness (arising from within) or a mental injury (caused by an outside force). Child abuse and neglect cause changes in the brain which increase the risk of mental issues in general. Torture is prone to cause PTSD, exhaustion, impairment, and depression. Insomnia and other sleep disorders are core symptoms of depression. Nebuly wobbles between insomnia and lethargy -- a hint that his body chemistry is badly out of whack. There are many different ways to overcome depression and to support someone through it. Learn how to cope with insomnia too. Partners or housemates can help by supporting efforts to improve sleep. "Cuppa" is short for "a cup of" something, usually tea. 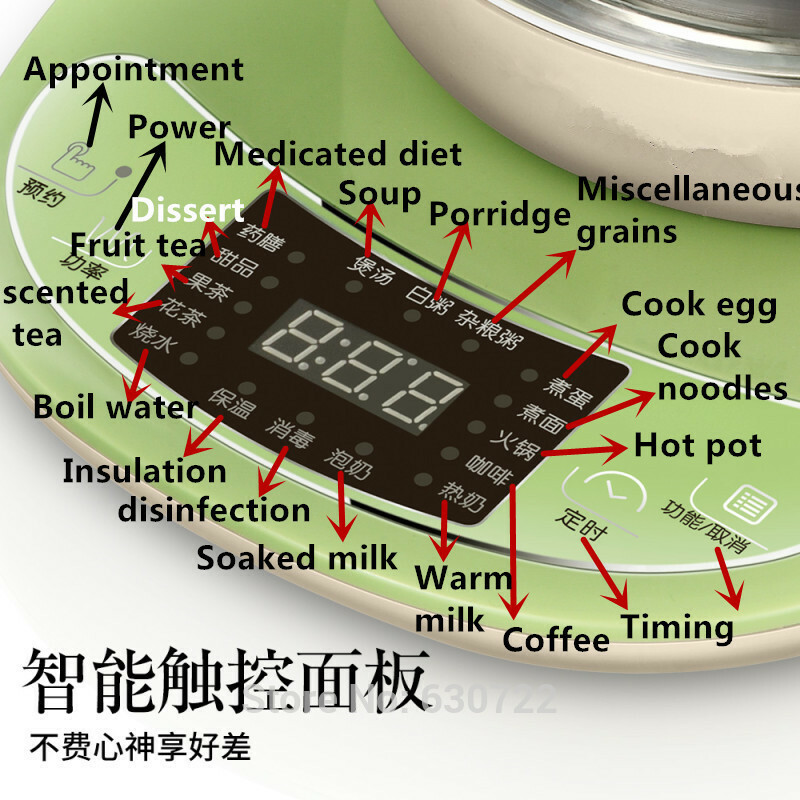 A health pot is a nifty Chinese gadget that cooks things in a kettle. This one has a fair amount of description in English. 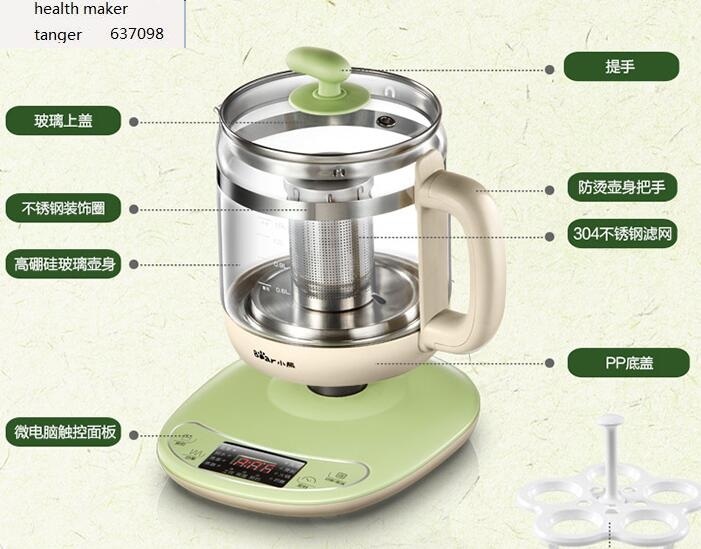 Marjoram's model comes with inserts for brewing tea and boiling eggs, although it can do a lot more than just those. The controls are labeled in Mandarin, so she had to add sticky labels with English translations. This tea combines some of the safest herbs, intended for flavor rather than effect. It tastes similar to green tea, brightened with lemon and mint, but contains no caffeine. Nettle leaf has a green flavor and lots of nutrients. Raspberry leaf tastes a lot like green tea without the caffeine, and is naturally sweet. If you add your regular amount of sweetener, it may wind up too sweet, so be sparing at first and taste the results. Alfalfa has a sweet grassy flavor high in nutrients. Lemon balm is bright and uplifting. Spearmint has a green, minty aspect that refreshes the mind. Thyme is a savory herb that benefits the digestion. This tea has a sweet floral flavor with a little spice. A combination of uplifting, soothing, and adaptogenic herbs buffer the mood. Oatstraw makes a nice grassy tea that is soothing and nutritious. Lemon balm is a citrusy tea that is both uplifting and relaxing. Rose petals are aromatic and mildly euphoric. Hibiscus has numerous benefits including improved mood. Lavender is relaxing for mind and body. 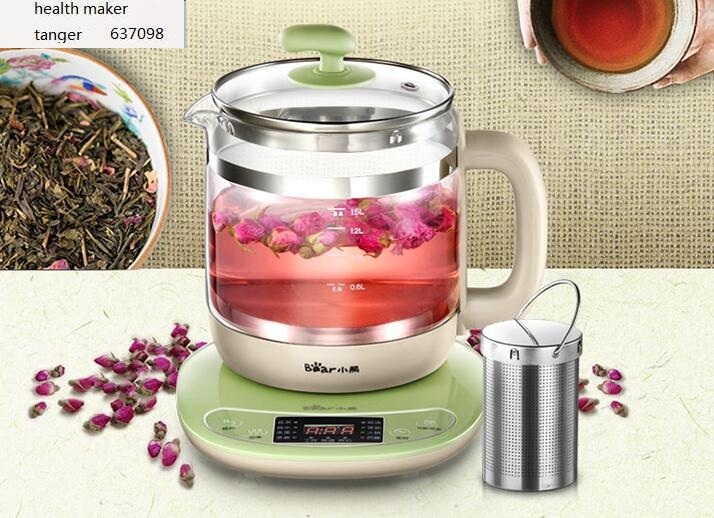 Jasmine white tea consists of white tea infused with jasmine. It energizes the body, promoting optimism and happiness. Holy basil soothes stress and helps the body adapt to challenges. This tea has a light, floral flavor with green and grassy undertones. It is soothing and relaxing but not soporific -- good for unwinding after work or as a very mild sleep aid. It includes nervines and adaptogens. Linden flowers are sweet and gently soothing. Sweet marjoram is relaxing and restful. Elder flowers are delicate, aromatic, and adaptogenic. Blue lotus petals are calming and enlightening. Mimosa flowers are adaptogenic and promote happiness. Red clover flowers can ease anxiety and insomnia. Bergamot has citrus and mint notes. It relieves stress, along with headaches, nausea, and other complaints that can interfere with sleep. Catnip is grassy and musky, a relaxing herb. Chamomile is sunny and grassy, a gentle sleep aid. This tea has a grassy, herbal flavor with definite medicinal undertones. It's a heavy-duty sleep aid with enough of a mystical kick to work well for most people with superpowers. Passionflower is a strong sleep aid. American ginseng is a potent adaptogen with other healing qualities. American Ginseng is "at risk" in local-North America but only "sensitive" in Terramagne-North America, due to avid efforts by wildcrafters to establish healthy populations. The Canadian Wildlife Scale is a useful measure of population health. Hop flowers are sweet, tangy, and strongly soporific. St. John's wort is among the best herbal antidepressants. It relieves low mood that can interfere with sleep. Valerian root is a potent herbal sedative. 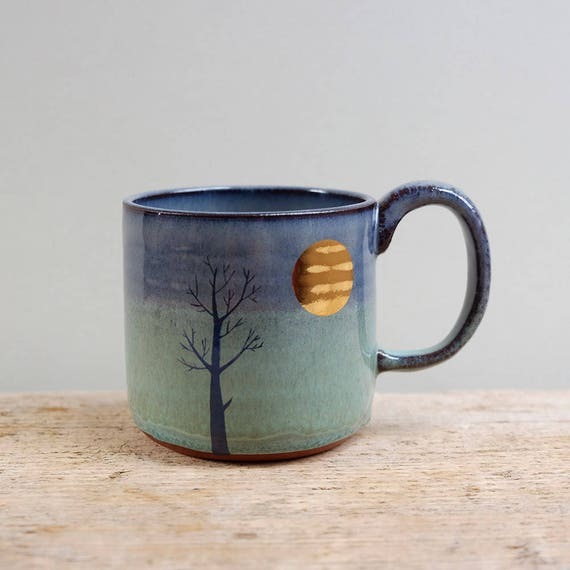 See Nebuly's pine mug. 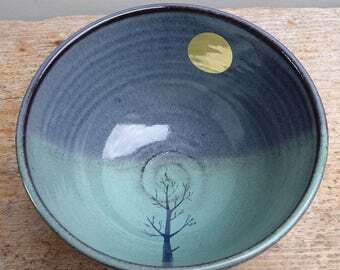 You can't see the raindrops on this one, they're inside the bowl. 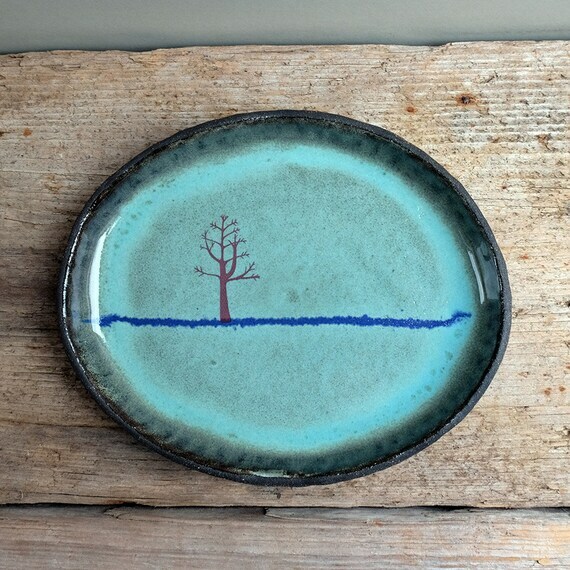 This is Nebuly's pine plate. 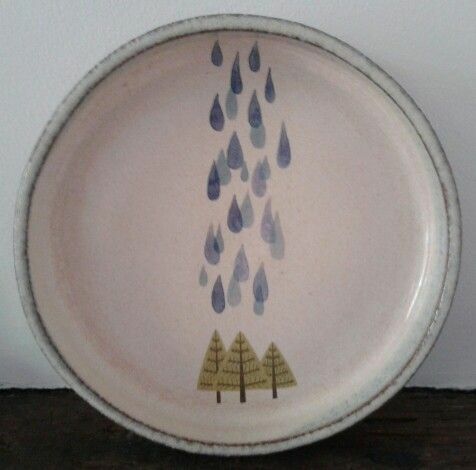 Here you can see the raindrops and pine trees together. 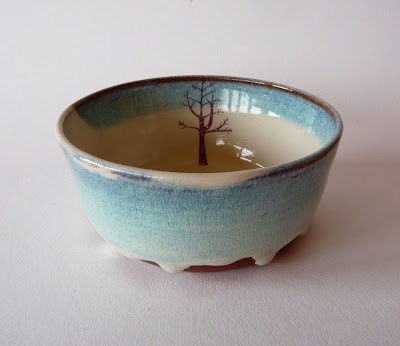 This is Nebuly's pine bowl. 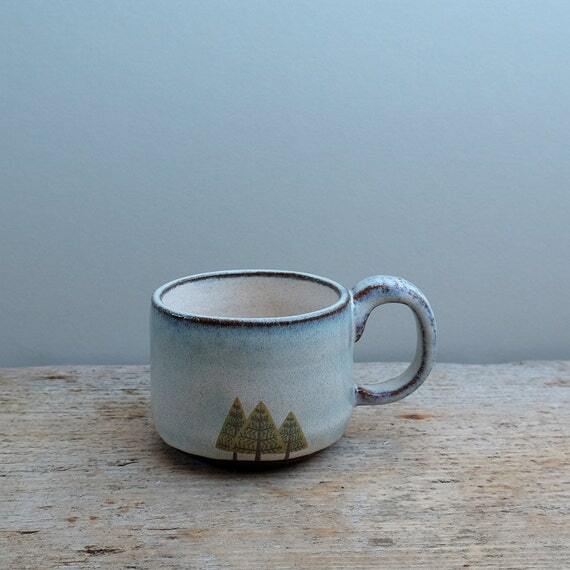 Now it's the pine trees that are hidden by the rim. 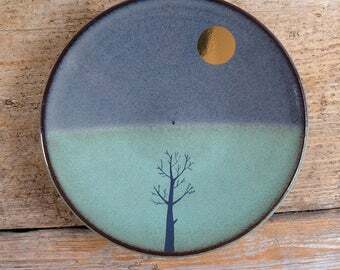 Here are Marjoram's moon mug, moon plate, and moon bowl. 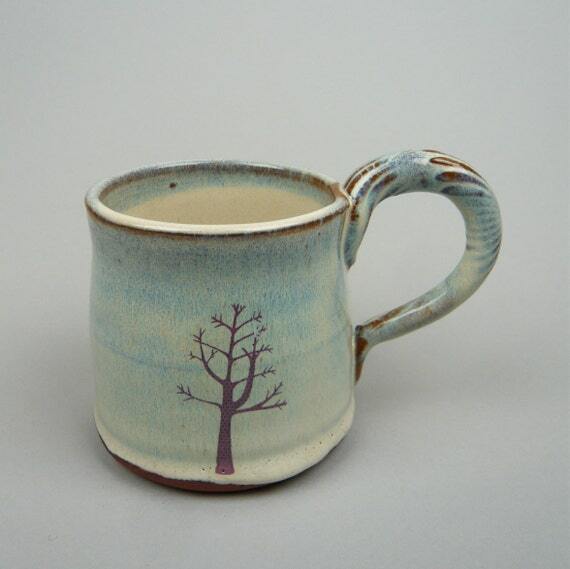 See Amergin's tree mug, tree plate, and tree bowl. Itinerant living has drawbacks as well as benefits; one of those is limited living space. When I traveled, we had three people in an RV built for six, which was comfortable, so we could have a few extra dishes. 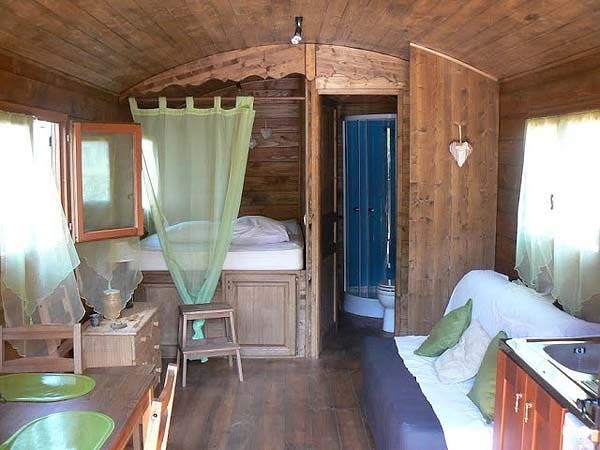 Amergin's vardo is built for four, would be comfortable for two, and is a bit snug for three. They really don't have room for extra dishes if they also want decent cookware, which means washing every dish immediately after use. It's a nuisance, but it's doable. Nebuly has so little stuff, he appreciates when Amergin and Marjoram give him things, but he has no idea how precious the space is. Dealing with difficult emotions is unpleasant, but suppressing them is worse. Learn to sit with a feeling as part of cultivating emotional intelligence. In T-America these are basic skills that most folks learn growing up. It helps in coping with indecision and anxiety. Depression and anxiety don't just occur alone, they can gang up on someone. Most of the time, Nebuly has depression and Turq has anxiety -- their similar experiences hit them in different ways -- but there are overlaps too. Understand how to deal with this combination. Hope is the sense that things could get better, even if they're bad now. Know how to cultivate hope and help a friend find hope. Amergin and Marjoram are very good at supporting Nebuly in this regard. I wish people in real life resolved their existential crises so easily. It's not so much resolved as it is gotten out of the chuckhole that Nebuly had fallen into. He'll still need time to adapt to living on the road, and the inside of his head is still a wreck, but at least now he has a plan for how to sort through his feelings about his new lifestyle. But yeah, life would be a lot better if more folks had EFA skills and could handle it better when a friend was struggling like this. Especially if EFA providers for kids recognized that the parents have the same issues, just with a little more in the way of experience points. If I'd had friends along to take care of me (or even just talk to!) I probably wouldn't have had the major depressive episode I dealt with my first long solo trip on the road -- or it'd've been a tough day with a probably-quick recovery afterwards. Nebuly's a lucky dude to have fallen in with Amergin & Marjoram. Thanks for the vote of confidence. This sounds like what I've heard from other survivors of depression -- being lonely makes it worse, having supportive friends can alleviate or at least buffer it. That seems to be what happens with Nebuly. His past creates a serious drag on his mood, but his friends help lift him out of the gloom, so he doesn't get stuck in it forever. Even though he's not okay yet, he's getting better, and he's in much better shape than he would be alone. Sooth. He has a place to stay, good food, sympathetic friends, and work when he's feeling up to it. Despite his challenges getting used to a traveling life, I think the change of scenery also helps to keep him engaged. What excellent people Amergin and Marjoram are! Whole page saved as "STRESSES & TEAS". What a LOVELY way to end the last day before Moving Day. This time tomorrow I shall have a flat and a cat all to myself... and aside from the cat and the 'net, very much alone. People often have trouble sleeping in a new place, at least for a while. Plan ahead if you can, with chamomile or harp music or whatever helps for you. Presumably including the cat.